"Hi everyone. This is Benno calling again. I just wanted to be sure that you got our message that we summited Chimborazo! We had good snow conditions the entire way. We feel very lucky to have accomplished this feat, because of the many guided and private groups that came to the mountain this year, very few people made it to the summit. It is not an easy mountain to get up, but I have to say this team did a fantastic job. Everyone was strong, kept a good pace, and they were meticulous about their technique – always being very careful and very secure. We had truly great rope teams. Everyone did such a good job. Right now we are in Baños after descending 14,000 feet, from 20,000 down to 6000 feet. So the atmosphere here feels very thick and delicious. It's warm, and everyone is enjoying the fact that we are surrounded by green and lushness. So we're going to enjoy a lot of good food here, maybe go to the hot springs for which the town is named, and maybe explore down valley tomorrow a little towards the Amazon. This is one of the country's main routes to the Amazon. So in summary, we are all quite well and very happy. It's been a great trip together! I'll try to call again Thursday night and let you know what we did for the day. 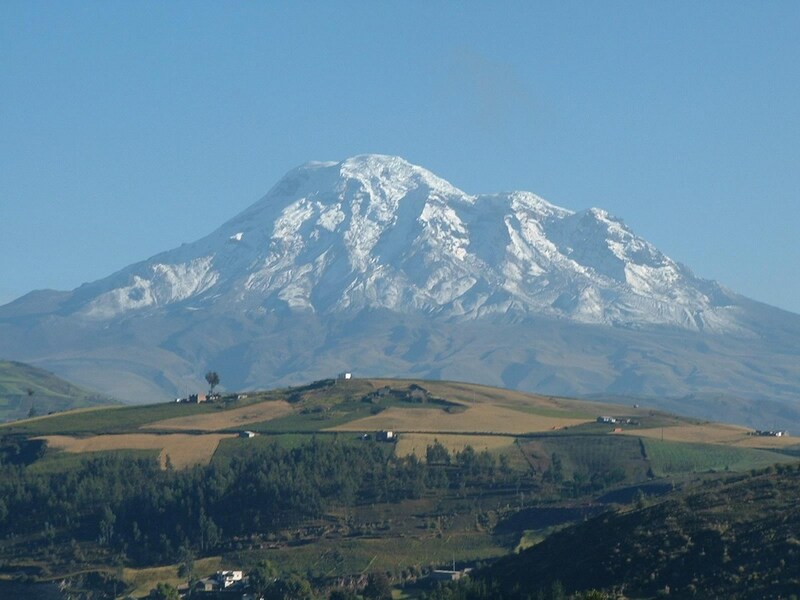 Ecuador High Altitude Expedition #6: Dispatch 11 – Summit Success on Chimborazo! Hello! This is Benno calling you from the summit of Chimborazo! This is Benno again, I lost the signal, last time I called. I’ll call you again and let you know what happens. We reached . . . we went all the way to the main summit . . . . Excellent conditions, good snow . . . .
We can see all the peaks in Ecuador and out over the Amazon. It's amazingly beautiful. We're all well and extremely happy to be here. We are now at the upper hut on the flank of Chimborazo at 16,400 feet. We have a very beautiful sunset right now. The mountain is clear and there’s no wind – truly perfect conditions. As you know we were at Urbina last night. We had an easy morning and were able to enjoy perfect views of our mountain. It was cloudless and clear, so we saw lots of detail on the peak. After breakfast we decided to drive into the big town of Riobamba; it's a nice place to look around. We visited the main square, a couple of churches, the railway station, and some people used the Internet. It's a pretty busy place. Good architecture, nice urban landscapes (including some palm trees! ), and good people watching. Later we drove up to the lower hut on the mountain and met the other two mountain guides on our trip there. They brought fIt got pretty cloudy during our hike up, but later it cleared off completely again. It's very exciting for everyone to see the mountain up close! Our team has already gone to bed because we are going to get up at 11:00pm and leave by midnight on the climb. If all goes well, it will take us about eight hours to reach the summit. There's only one other rope team here at the hut, so we are basically going to have the mountain entirely to ourselves. That will be an amazing feeling on this huge mountain. OK. Time for me to go to bed too. Thanks for the messages and good wishes. We'll call you in the morning from high on the mountain and with luck it will be from the summit. We will see! Ciao Ciao."